Instagram has evolved a lot over the past few years – and has added a lot of game-changing features which made the social network transform into a big marketplace for new and existing brands. One of the latest novelties in the list is the Instagram Shopping Checkout feature which is growing as a trend and allowing brands to ramp up their sales on the social network. Today, we are discussing everything about Instagram Shopping Checkout and letting you know how you can benefit from this feature to revolutionize your sales – even through a social network. What Is Instagram Shopping And Checkout? It all started from a general interest which Facebook and Instagram together had – to develop something that will enhance both the user experience and make it much easier for people to buy products on Instagram. As the head of product at Instagram Vishal Shah said, “users are constantly discovering new products and actively want to convert.” This can also help brands sell on Instagram and use the social network’s authority to expand their revenues and profits. IG Shopping Checkout is nowhere near “shoppable posts.” Instead, it is a superior feature where a user browses through products, needs to enter their payment details and begin making purchases – within the app. This comes as a huge development for Instagram and businesses advertising their products on the app, mostly because users don’t have to leave the page to another website. As soon as you do this, you will receive a notification from Instagram when the product has been shipped and another one when it has been delivered to your address. 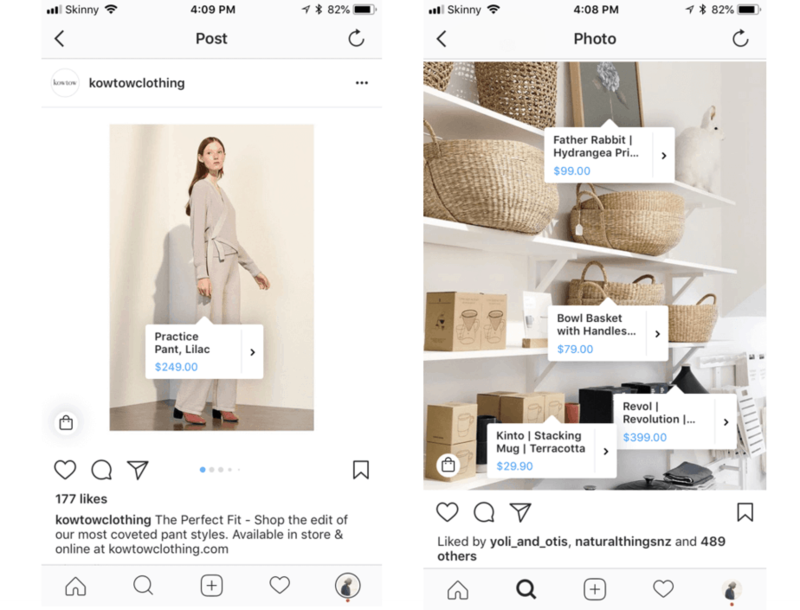 With this feature, Instagram did not want to add an add-on to its shopping experience. Instead, it set the first stone towards creating an all-in-one social media buying process which reduces the clicks that it takes for us to complete a purchase and with that reduces the time for the landing page to load. Even though the feature is still in the alpha stage of development and needs to be fine-tuned even more before its public release, it will probably be expanded worldwide when the bugs are worked out. For customers, it is great because it simplifies the buying process and makes the buyer journey a lot easier. As a consumer, you can preview and buy products in the blink of an eye. For brands selling through it, it gives them a streamlined channel and a lot of opportunities to reach wider markets. Similarly, it puts the product in front of an audience that is ready to shop. For Instagram, the profits will come from its ads as well as a “selling fee” which is intended to cover all the transaction costs (even though this figure is unknown at this time). How to Set Up Shoppable Posts And Use Instagram Shopping To Drive Sales? More than 130 million Instagrammers tap to reveal the product tags in shopping posts – every month. This means that if you are not selling through Instagram, it is about time to get started. Step 1: Get approved as a business profile – Make sure you get approved as a business in order to sell on Instagram and review Facebook’s merchant agreement and commerce policy. Step 2: Add a Shop section on Facebook – At this point, you will need to set up your product catalog on Facebook using Shopify or BigCommerce. The products in your catalog are what you will able to tag in your Instagram posts and Stories. Step 3: Wait for your account to be approved for shopping – Instagram will review your account and eventually approve it for shopping. Once they do that, you will receive a notification from them with a confirmation. Step 4: Turn on your Shopping features in your account – Start adding products to your posts! How To Add Products To Your Instagram Posts? The beauty of Instagram Shopping and Checkout is the fact that you can also add products to your Instagram posts. Just like your normal posts, they will have the option to reveal the product tags and add up to five items per image. Step 1: Upload your image or images – You can tag up to 5 items per image – or up to 20 if you are sharing a gallery (carousel) post. Step 2: Add your caption and tag your products – After you have finished writing the caption for your unique post, it’s time to “tag products” in a feature that will appear below “Tag People” once you have your shopping enabled on your account. Step 3: Start including the item names you’d like to tag – Once you tap on “Tag Products”, Instagram will pull items from your Facebook product catalog that match the words that you type – so that you can tag any product that you have added. Step 4: Time to share your post – Share your shoppable post – it will appear with a little shopping bag in the top-right corner. How To Set Up Shoppable Stories On Instagram? 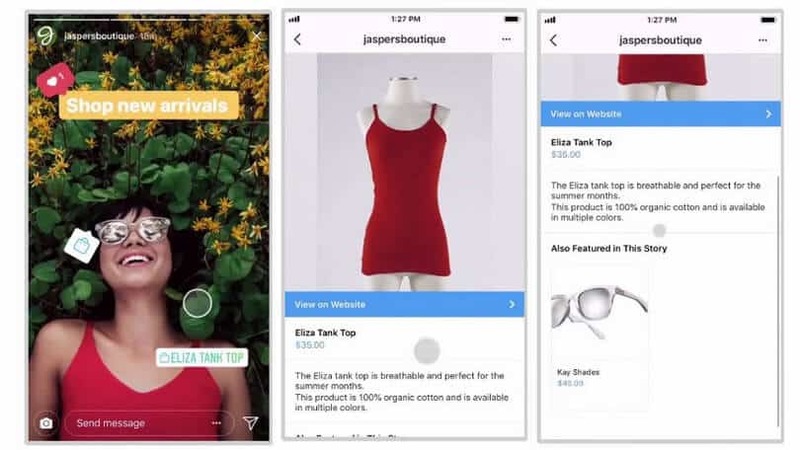 The Shoppable Stories phenomenon was launched in September 2018, where businesses that are approved for Instagram Shopping and Checkout can add one product sticker to any story. Simply put, when a customer taps on the product sticker, they will be taken to the same product details page that they would see if they tapped on a shopping post in their feed. Here, they will be able to see more product images from your catalog as well as product details, similar items and a link to the mobile site to make a purchase. Step 1: Add your Story (Video or Photo) – Add your story just like you would in the normal way. Step 2: Tap the sticker icon in the upper-left corner and select the product option – Select the product option from the sticker. Step 3: Add your item – You can add only one item per Story and easily find it in your product catalog by typing its name (just like you would in the post). You can also change the color of the sticker at this phase. Step 4: Start selling through your Stories – The tagged products will show with a shopping bag icon and users will be able to tap it to view the full product details – just like they would on a post. The Explore Tab by Instagram is another powerful tool with more than 200 million visitors going there to discover new content and dig deep into their interests from day to day. They browse through topic channels and various other interests. In September 2018, Instagram launched a specific topic channel for shopping – which is based on each user’s specific interests and displays shopping posts from a variety of businesses that the user may like (but don’t follow yet). This Explore tab is a huge opportunity especially for small businesses without large followings. 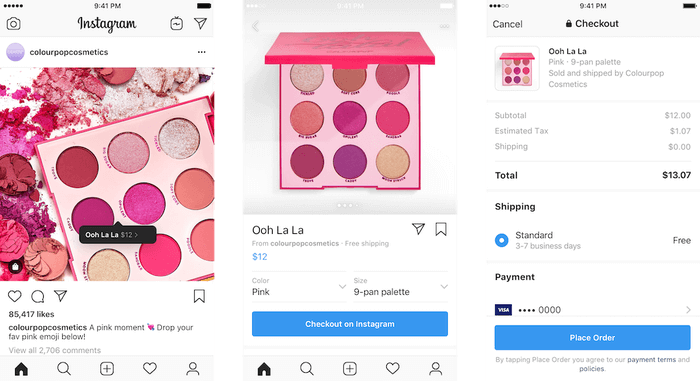 Instagram Checkout was born in March 2019 as an in-app shopping experience that is taken one step further thanks to its checkout feature. The feature is just what it sounds like – something that enables users to purchase products without leaving the app. Even though this feature is still in its beta version in the US, brands in the likes of Nike, Zara, Outdoor Voices and others are involved in testing before the checkout rolls out globally. So, How To Sell More With Instagram Shopping Checkout? Now that you know the concept of Instagram Shopping from start to finish, it’s time to get some actionable advice on how to sell more through these revolutionary features. Tag a single image or a carousel – Get more value out of your photos by tagging a single image and featuring a product that you sell in it. Make it clear for the customer to see how that product is worn, combined, used or placed in the ideal scenario. Tag multiple products in one post – Have a collection of products that is ready for Instagram shoppers? Add your carousel post and tag every product in a different photo. Multiple items mean multiple chances to catch the eyes of your customers. Make sure your tags are attached to the right products – The items that you tag in the posts must be items from your Facebook product catalog. Shopping on Instagram is best when it is direct, precise and without any distracting nuisance. Whether it’s codes or numbers, we let you figure out the best way to display the products. Create consistent shopping journeys – Every shoppable post should be a journey – and an invite for your follower to make it feel like a natural fit for customers. The transition should be seamless and the post should tell a story. Promote your store on other platforms – If you want to get more Instagram buyers and followers, you can include your newest feature in your newsletter, social media, cross-promote it on Facebook or Twitter, run contests and make your Instagram account more discoverable. Use descriptive hashtags – Your hashtags should describe your posts accordingly so that your followers have more opportunity to discover your products. If you use them effectively, you can boost your visibility and reach new customers. Focus on high quality images/videos – “Visual first” is a great approach through which you can ensure that your posts and Stories are eye-catching and compelling. Never compromise their quality at the expense of pushing out a lot of product images – your buyers will notice this. Share your products in action – One of the best ways to showcase your products on Instagram Shopping is when they are in action. Get creative and show the unexpected side of your brand. In the end, it is safe to say that Instagram is evolving and growing very fast. The shopping experience may replace a lot of our favorite ways to shop online and will certainly bring a new perspective to social networks. Even though not all of the features are ready and in action (yet), you can definitely play around and get revenue from Instagram as your brand new shopping channel.